(13 photos of a 1965 Grabber Blue Mustang Hardtop) Carson's Mustang is in the paint both receiving a coat of blue paint. It's the Grabber Blue from the 2009 and 2010 Mustangs. The openings are masked off with paper and tape. Notice how the masking goes right down to the floor. This is so that overspray has no chance to get to the underside of the car. (5 photos of a 1969 Grabber Blue Mustang Shelby GT-350 Fastback) This is one cool looking Grabber Blue 1969 Mustang Shelby GT-350 fastback. Grabber Blue wasn't offered on the regular Mustang in 1969, only on the Shelby. This one has white stripes and a black interior. (5 photos of a 1970 Grabber Blue Mach 1 Mustang Fastback) Take a look at this Grabber Blue 1970 Mach 1 Mustang fastback. It was our Attitude Of The Week featured picture for the week of 8-12-07. Factory options include: Options: Mach 1 package, 428ci SJC engine with drag pack, 4-speed close ratio manual transmission, black hood stripe, dual paint stripe, convenience group, F70x14 belted tires with raised white letters, AM/FM stereo radio, Tinted glass, front chin spoiler, and rear spoiler. (5 photos of a 1970 Grabber Blue Mustang Hardtop) Grabber Blue 1970 Mustang hardtop owned by Frank Norman from Cleveland, Texas. This was our featured Attitude Of The Week for the week starting August 22, 2010. This car came from the factory in Grabber Blue. It has a 351ci V8 and an automatic transmission. Frank tells us more, "I have had it since my senior year of High School in 1992. It has come down a long road. It had an '89 302 when I bought it, but it didn't last. I found a '72 Torino with the Cobra Jet Cleveland and C6. It has been warmed .030 over, Weiand intake, Holly 750, Isky valvtrain, Crane rollers, etc, Mach 1 seats, custom console, Grant steering wheel, etc." (17 photos of a 1970 Grabber Blue Mach 1 Mustang Fastback) Grabber Blue 1970 Mustang Mach 1 fastback with 351 cubic inch, originally 2 now 4 barrel V8 engine. (7 photos of a 1970 Grabber Blue Mach 1 Mustang Fastback) Grabber Blue 1970 Mustang Mach 1 fastback with a 300hp (at 5400rpm), Cleveland 351ci, 4 barrel, V8 engine. This Mach 1 has metal rocker panels with the Mach 1 lettering; Magnum 500 wheels; flat black hood stripe, air dam, and hood scoop. (5 photos of a 1970 Grabber Blue Mustang Shelby GT-350 Fastback) This is a Grabber Blue 1970 Mustang Shelby GT-350 fastback with black hood stripes. Grabber Blue was an awesome shade of sky blue that grabs anyone's attention. This one has a white interior and a manual transmission. (15 photos of a 1970 Grabber Blue Mustang Sidewinder Fastback) This is a 1:18 scale, Ertl, die-cast metal, model of a Grabber Blue 1970 Mustang Sidewinder special Mustang. This promotion should not be confused with the 1970 Twister Special. David Charlier has collected a lot of information on this special along with photos and information on many of the roughly 40 built. Coming in any color, most striking feature of this car is the rear fender Sidewinder graphic of a snake with wheels. (7 photos of a 1971 Grabber Blue Mach 1 Mustang Fastback) Grabber Blue 1971 Mustang Mach-1 fastback with a 351ci 4-barrel V8 engine, C-6 Select Shift Cruise-O-Matic automatic transmission, and a 3.00 standard axle. Options include; Selectaire air conditioning, Mach-1 sports interior group, power steering, power front disc brakes, AM/FM Stereo, console, Deluxe seat belts and warning light, factory tinted windows, color-keyed spoiler and front bumper, color-keyed racing mirrors, NASA/NACA style hood scoops, grille sport lamps, competition suspension, trim rings with hub caps, and steel guard rails. (2 photos of a 1971 Grabber Blue Boss 351 Mustang Fastback) Ford promotional photo of a Grabber Blue 1971 Mustang Boss 351 fastback with silver side stripe, silver hood with hood vents, Magnum 500 wheels, and a 351ci V8 under the hood. (6 photos of a 1972 Grabber Blue Mach 1 Mustang Fastback) A lowered Grabber Blue 1972 Mach-1 with a 168 hp, 351 cubic inch, 2 barrel V8 engine and Magnum 500 wheels. Options ordered on this car above the standard Mach-1 options include: FMX Cruise-O-Matic Transmission, power steering, AM radio, center console, and deluxe seat belts with warning light. The door data tag reads: 63R for fastback Mach 1 body style, 3F Grabber Blue paint, AA black interior trim, 22.74:1 rear axle ratio, X FMX automatic transmission, and 74 Seattle original ordering district. (4 photos of a 1972 Grabber Blue Mach 1 Mustang Fastback) Grabber Blue 1972 Mustang Mach 1 fastback owned by Tim from Denver, Colorado. This was our featured Attitude Of The Week for the weeks starting December 19, 2010. The Mach 1 is parked in front of a wall mural of 50s film stars. With the help of site visitors, those are Humphrey Bogart, Marilyn Monroe (of course), and Marlon Brando. Tim's Mach 1 has it's original 351ci V8 engine and an automatic transmission. (10 photos of a 1973 Grabber Blue Mustang Convertible) Grabber Blue 1973 Mustang convertible with silver side stripes, Magnum 500 wheels, fog lamps, color keyed sport mirrors, silver painted rocker panel trim, white deluxe interior, and a 351ci 2-barrel V8 engine. This car was originally Blue Glow but this Grabber Blue (introduced a year later in 1974) is still hot. (10 photos of a 1974 Light Grabber Blue Mach 1 Mustang Hatchback) Light Grabber Blue 1974 Mustang Mach 1 with the 170 hp (at 4000 rpm), 170 cubic inch (2.8 liter), 2 barrel, 6 cylinder engine. Standard Mach 1 exterior options on this Mustang are styled steel wheels with chrome trim rings, remote control racing mirrors, and unique paint tape treatment. Additional options include: front and rear bumper guards and vinyl insert bodyside moldings. 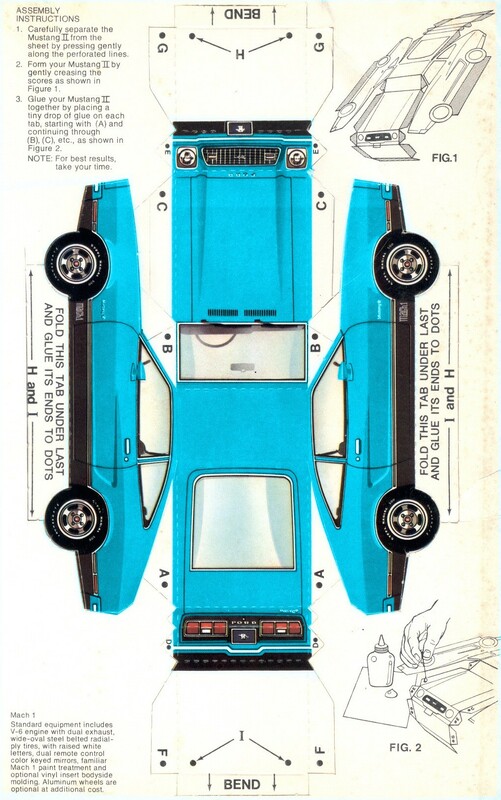 (1 photo of a 1974 Mach 1 Paper Car Mustang Promotional Sales Brochure) Here is a Grabber Blue version of the paper car model to cut out. Save the image to your harddrive or click here to remove all the borders for printing. See the red car cut out for additional instructions. (9 photos of a 1979 Grabber Blue Mustang Coupe) Check out this Grabber Blue 1979 Mustang notchback owned by Taylor Solmos from Bremen, Indiana. It was our featured Attitude Of The Week for the week starting February 14th, 2010. Taylor shares, "This is my 1979 Mustang coupe with a modern day cobra package. It was restored in 2009. Powered by a new 302 V8 with 4 barrel carb, longtube headers, etc. I still have the original engine. This car was bought for $300. It was missing a lotta parts and in severely rough shape, but almost totally rust free!"